Are you and your smartphone inseparable? If so, you're not alone -- plenty of research illustrates how increasingly addicted we're becoming to our mobile devices, including one survey showing that 66 percent of people are actually afraid to lose or be separated from their cell phones. And if rising rates of sleep texting aren't enough to signal our addiction to our cell phones, we don't know what is. The iPhone is the most popular smartphone in America, and its latest incarnation, the iPhone 5s, was released in the U.S. last Friday to much frenzy and fanfare. But before you get too excited, keep in mind that excessive smartphone use could have negative effects on your health. 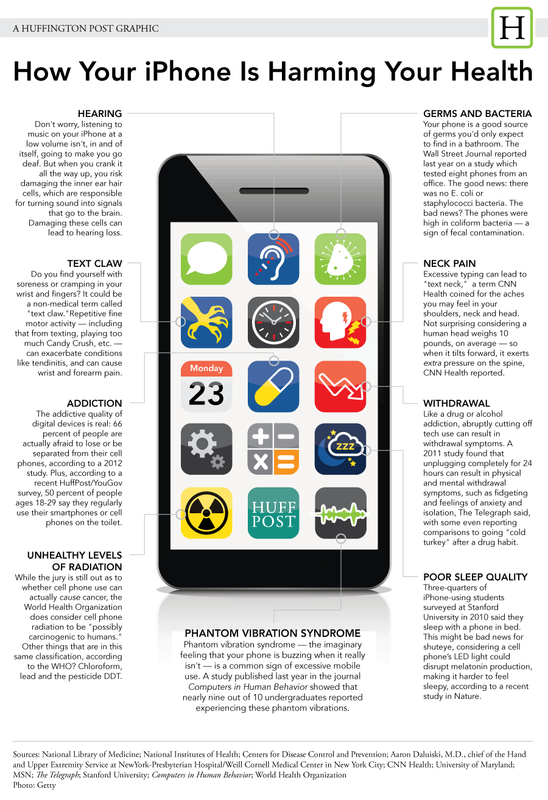 Check out the infographic below for to find out how your iPhone (or Droid or Galaxy or any smartphone for that matter) could be messing with your physical and mental well-being.